Greeting Cards Wholesale Suppliers | Companies - Harnel, Inc.
We provide wholesale greeting cards for all the occasions you can think of. From birthday cards and anniversary cards to friendship cards, sympathy cards, and more - we have all the cards that you need throughout the year to greet and wish your loved ones, friends, colleagues, neighbors, and everyone else you share a bond with. Our objective is to make your special occasions unforgettable by helping you choose from a variety of unique greeting cards.We are one of the top greeting cards wholesale suppliers, and we are proud that we are associated with something that helps in bringing a smile on people’s faces and making their special day even more beautiful. If you are a looking for a wholesale greeting card companies in your area that can offer you greeting cards for different occasions at an affordable price, you have come to the right place. We believe in making your association with us beneficial for you. We have so much variety that you will find it tough to first run through all the available choices and then select a bunch of cards from all what you have seen. Whether it is for an occasion or just to say “Thank you” to a loved one for a favor they did for you recently, you will find greeting cards to express all your feelings. There are many times when you don’t either have the right words or run short of expressions to communicate your emotions to the person in front of you. This is where greeting cards come in very handy. They will express your feelings on your behalf without you having to utter even a single word. We provide you with a way of getting your unsaid words through to the person they are meant for. Browse our huge greeting cards collection to find options matching your requirements. You can buy greeting cards in bulk with us - which means you will also be eligible for a great discount on your purchase. 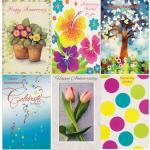 Shop for discount greeting cards - express feelings - save money. 100 Envelopes - 5.25" x 8"